The artist will customize your print by hand-painting a name on the panel under the exhaust manifold. Dedicate this plane to your wife or girlfriend. 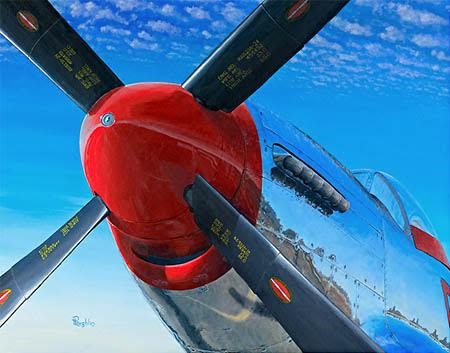 Give your husband his very own magnificent warbird customized with his name. Or memorialize a Veteran family member. Your choice of name, font, and color, but the artist has final say and may make adjustments based upon artistic requirements. He'll work with you to get something you like. Allow three additional weeks for delivery. Order "custom name" when you place your order. Virginia Bader Fine Arts will provide your name, phone number, and email address to the artist, who will contact you separately and initiate a discussion about exactly what you want. Custom names are $150 for any size of print.